NAACP leaders join LDS church leaders on Temple Square in Salt Lake City for a breakfast meeting prior to the first session of the Church of Jesus Christ of Latter-day Saints’ general conference on Oct. 6, 2018. 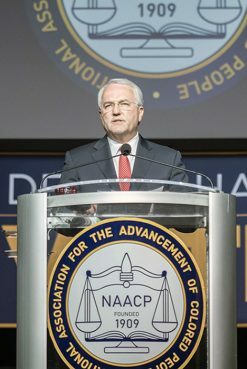 ©2018 Intellectual Reserve Inc.
Elder Jack N. Gerard, of the Seventy of the Church of Jesus Christ of Latter-day Saints, announced expanded collaboration between the NAACP and the church at the organization’s 109th annual national meeting in San Antonio, Texas, on July 15, 2018. ©2018 Intellectual Reserve Inc. The collaboration, scheduled to launch next year, comes as the LDS church marks the 40th anniversary of the “revelation” about race that then-President Spencer W. Kimball declared he received. According to that revelation, the Mormon priesthood was no longer limited by color, opening the way for blacks to have leadership positions. The dialogue between the two groups started officially this spring when the LDS church hosted a “unity luncheon” for NAACP board members in Salt Lake City. That was followed by the first-time speech of a top LDS leader at the civil rights organization’s annual meeting in July. Then NAACP board members attended a portion of the recent Mormon biannual conference. The collaboration will be based on internal LDS “self-reliance” programs, which church leaders say they hope will enhance the employment opportunities and financial well-being of participants. Planners anticipate the programs will primarily be attended by African-Americans and be held in black or Latino churches, Mormon meetinghouses and recreation centers in cities including Atlanta, Chicago and Camden, N.J.
Corbitt, who previously was the African-American president of the stake, or regional area of Mormons, in Cherry Hill, N.J., said the church’s programs usually occur once a week for 12 weeks. But the duration and frequency of the collaborative programs may be different. Brown, in an interview, said he believes the LDS church is focused on fostering better education and employment opportunities through the initiative rather than building its membership of 16 million people worldwide. 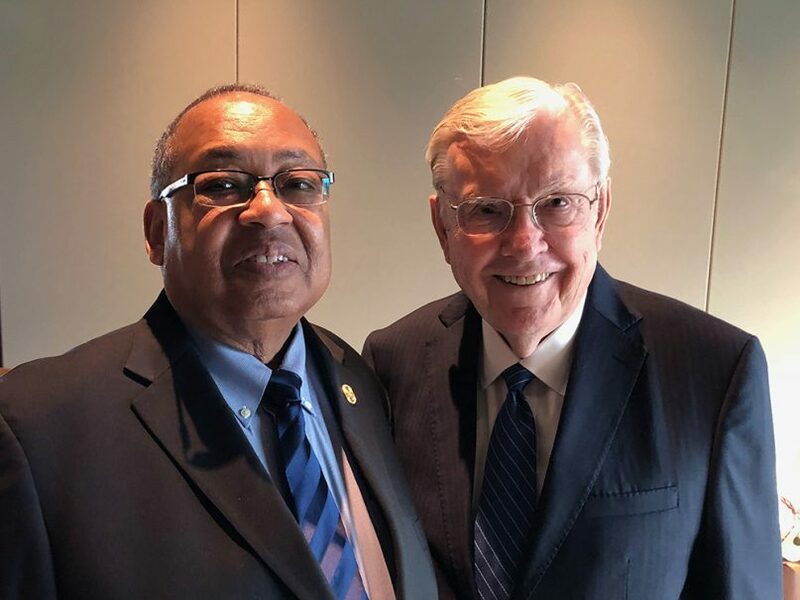 Leon W. Russell, left, chairman of the board of directors of the NAACP, with President M. Russell Ballard, of the Quorum of the Twelve Apostles, on Temple Square in Salt Lake City on Oct. 6, 2018. ©2018 Intellectual Reserve Inc.